March | 2016 | ARTZCOOL'S BLOG! A friend of mine that is in advertising has been telling me that I should be making You Tube videos… (Thanks Mandip!) Blogs are out, and vlogs are in. Apparently kids today don’t want to read anymore, they just want to watch videos…can you imagine?? But, seriously, not surprising. And, I do have to admit that there is something cool about watching a craft project or recipe happen in a minute. Anyways, I thought I would give it a shot. So, here is my first attempt at a video… I had Dylan help me with the editing and technology part, and Sam did the voice over. Here is the link to my Artzcool You Tube channel! It is a video of one of my Easter craft projects. I have a couple more Easter projects to share… Hopefully I’ll get them posted by the summer. Lol. 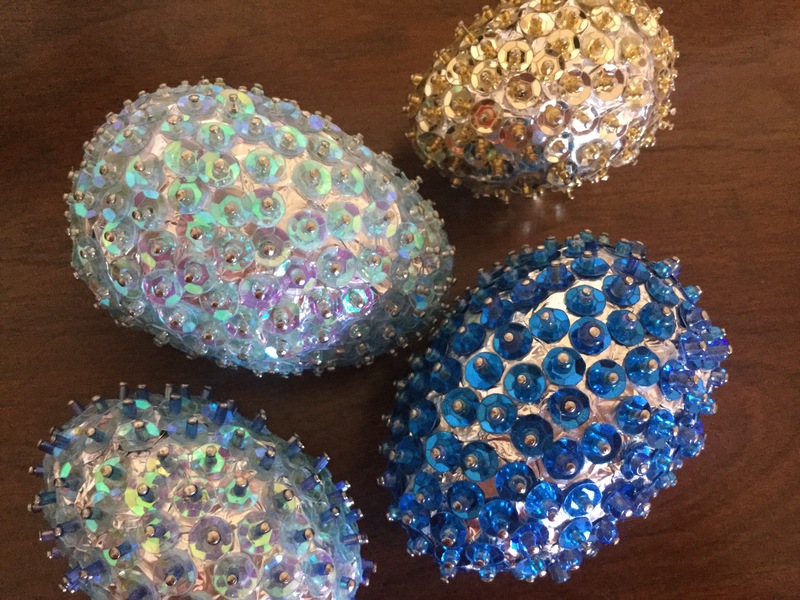 These eggs are made the same way I have made Christmas ornaments, using sequins, beads, and straight pins. When I saw the styrofoam eggs in the dollar store, I thought eggs would be just as cute as ornaments.